Three Lakes Camp bays, creeks and rivers for northern pike and walleye fish habitat in Saskatchewan Canada. Jan Lake, with its rocky shores, hidden sand beaches, many islands and secluded bays, offers a range of settings from open water to sheltered passageways between scenic islands, all easily reached by boat from the camp. Walleye, Northern Pike, Whitefish and Yellow Perch are caught all season long, but the prime fishing months are May, June and September. 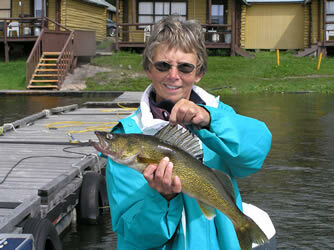 Lakes offering Rainbow, Brook and Lake Trout are close-by and accessible. The summer months also lend themselves to family vacations with a swimming beach and playground a short 10-minute walk from the camp. A well travelled nature trail offers a closer look at the diverse plant life in the area. The scenery of the rugged Precambrian Shield, the sparkling blue waters and the splendid fall colors of the boreal forest offer many opportunities for photographers and artists. 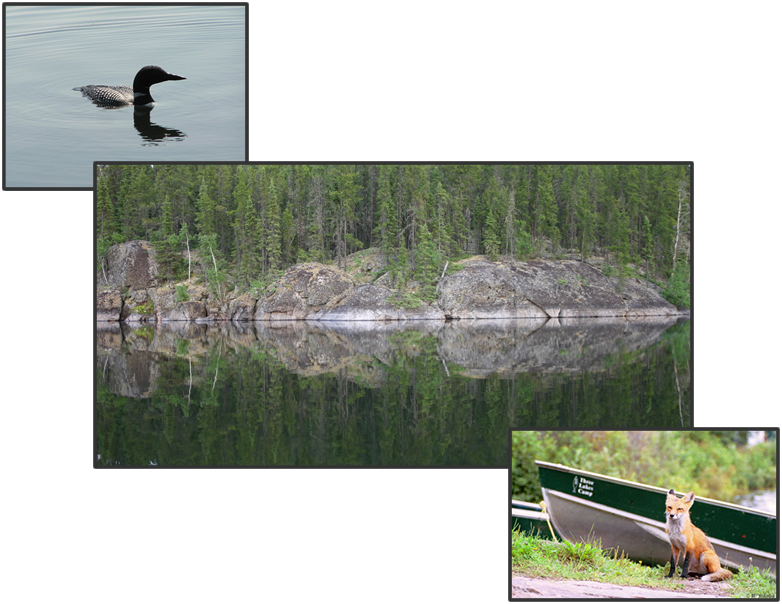 Wildlife abounds in this natural habitat with sightings of black bear, beaver, moose, woodland caribou, wolves, muskrat and otter. Nesting sites on the lake are plentiful for bald eagles, great blue heron, loons, and a wide variety of ducks. The Northern Lights may be seen all year around, but are most spectacular during the fall. They dance across the skies, on cool, crisp fall nights. Jan Lake is defined by her many islands and passage ways. Jan is connected by water to Deschambault, Pelican and Mirond Lakes allowing travel from Jan all the way to Mirond through Pelican by power boat. Deschambault may be reached by canoe or other smaller craft. Many access ways and portages exist from the main lake into small ponds and secluded bays. Truly you could spend years exploring Jan and not see all the hidden nooks and crannies...though many have tried. Jan is around 15 miles long and 7 miles across but still considered a safe lake to navigate on account that you are never out of sight of land. 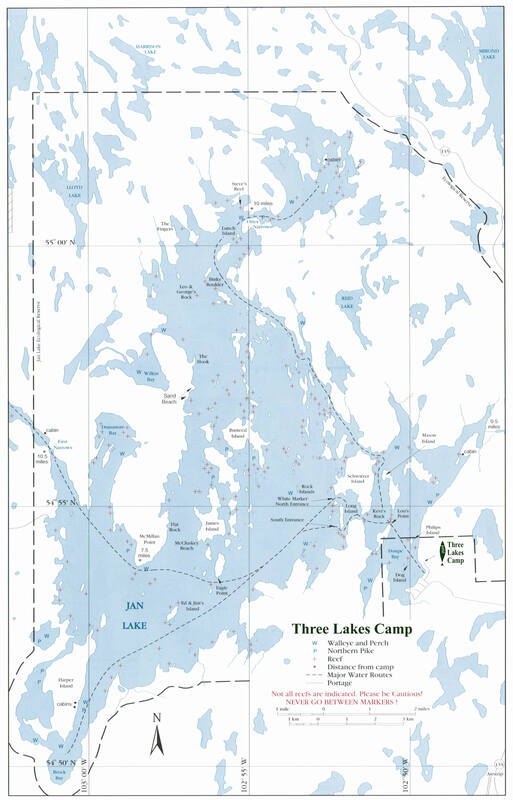 As with all lakes located on the Canadian shield Jan has her fair share of hazards (note the reef markings on the map) however several safe routes to the more popular fishing grounds exist. From that point, a slower pace keeps you out of trouble. Learning the basics to getting around takes a day or two but once you become familiar, there is no other lake like it.